SKU: EF-E1310(GR). Categories: Home Appliances, Fridge, Freezer & Chiller, Freezer. Are you looking for a freeze that operates at a lower temperature so that it can store food much longer? Elba is the only solution for your search! 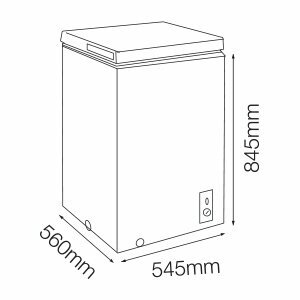 The Elba chest freezer has a 130L gross capacity and runs with an input power up to 100W. The elegant and exquisite design makes it perfect to give the perfection look to your house. With deep cooling and quick freezing your food will sure be safe and store for a longer period of time. This low energy consumption Elba Chest Freezer has a space saving interior whichmeans you can store as many as possible food! Grab now and eat up! Elba is a popular home appliance brand in Malaysia reigning under the company Fiamma Holdings Berhad (Fiamma). Despite its humble beginnings and small workforce, the company was big on ideas and growth plans. Within a short time, Fiamma expanded its activities to Kuala Lumpur, where its head office is based today. It gradually established branches, service centres and an extensive network of dealers throughout Peninsular and East Malaysia. Today, Fiamma represents some of the world’s major names in electrical appliances, sanitaryware, kitchen cabinets, bathroom fittings and healthcare products. Freezer RangeKeep your favourite foods fresh with ELBA’s extensive range of innovative freezers, showcases, refrigerators and mini bar that give you convenient storage options while spelling understated elegance at a modest price. Our product range is equipped with ELBA’s latest R600a refrigerant which is more energy efficient and leaves fewer carbon footprints to the environment. These contemporary and efficient pieces uplift your kitchen with an upscale touch both inside and out. Fall in love instantly with ELBA’s proven record of satisfying performance and sleek slate finishes.